Unlike conventional digital reverberators, which synthesize reverberation using contrived signal-processing algorithms, the new Yamaha SRev1 Sampling Reverberator from Yamaha employs digital convolution processing to impose an acoustic “fingerprint” of a previously measured environment onto any audio signal, faithfully recreating the original reverberation, with accurate reflection detail identical to that produced had the sound been heard in that environment. The Yamaha SRev1 is perfect for recording studios, audio post, broadcast, concert halls, theaters, or anyone looking for superb quality reverb that sounds just like the real thing, with the option to sample the reverberation characteristics of any location for use back in the studio. 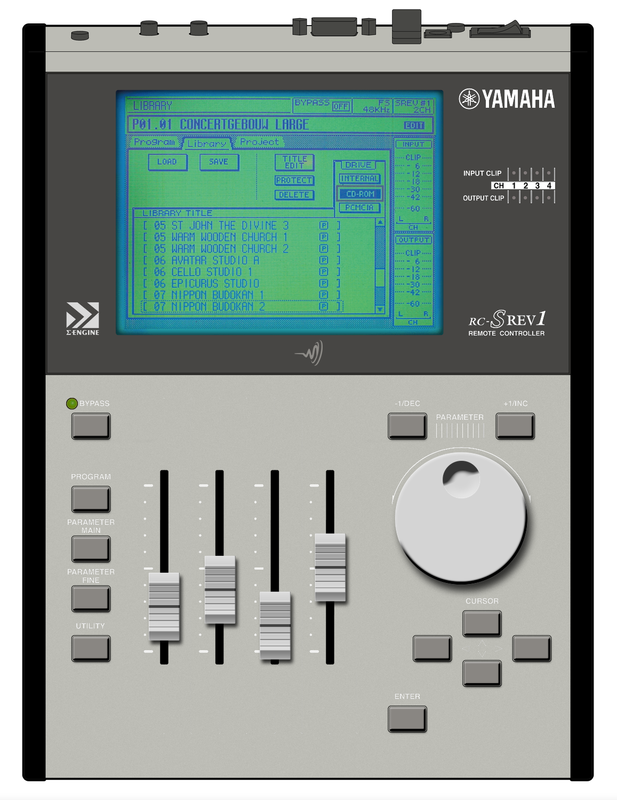 In addition to stereo reverb (2-channel mode), the Yamaha SRev1 offers four-channel process- ing for surround reverb (4-channel mode). Alternatively, the Yamaha SRev1 can be configured as two fully independent reverberators (2-channel x2 mode), each with its own inputs, outputs, and program settings. Thirty-two of Yamaha’s new convolution chips provide the necessary “horsepower” for real-time convolution of up to 5.46 seconds per channel (2-channel mode), 2.73 sec- onds per channel (4-channel or 2-channel x2 mode). Featuring an additional 32 con- volution chips, the optional DB-SREV1 DSP Expansion Board doubles the available convolution time to a maximum of 10.92 seconds per channel (2-channel mode), 5.46 seconds per channel (4-channel or 2-channel x2 mode). Measured impulse response data is combined with variable parameters such as reverb time and initial delay to form reverb programs, which can be stored in special Quick memories or the Internal Card or PC Card. Up to six programs can be stored in Quick memory in 2-channel or 4-channel mode; 12 in 2-channel x2 mode. Programs in Quick memory can be recalled instantly via the optional RC-SREV1 Remote Controller or MIDI Program Changes. Projects, which contain all the Quick memory programs and the current program set- tings, provide a convenient way to manage programs and settings for each job. Projects can be stored on the Internal Card or PC Card. The PC Card slot is fully compatible with the PC Card ATA specification and supports the FAT16 file system. The CD-ROM drive supports the ISO9660 Level 2 format. Both the PC Card and CD-ROM format is compatible with Windows. The supplied CD-ROM contains preset reverb programs of famous venues from around the world, and a CD-ROM library is planned for future release. The preset pro- grams on the supplied CD-ROM are loaded into the Internal Card at the factory. Program editing is handled at two levels: Main parameters and Fine parameters. With Main parameter editing, channel parameters, such as reverb time, initial delay, reverb balance, EQ, etc., are grouped, so that, for example, the reverb time of all channels can be set simultaneously. Fine parameter editing adds pre-convolution 4-band PEQ, post-convolution 4-band PEQ, and impulse-response data loading. Reverb parameters can be edited individually or grouped. Reverb balance and reverb level parameters for each channel can be controlled individually via MIDI Control Changes. Two AES/EBU inputs and outputs (providing 4 channels) are built in and two mini YGDAI (Yamaha General Digital Audio Interface) slots offer various analog and digital I/O options (AES/EBU, ADAT, Tascam). Inputs can be assigned to channels individu- ally, allowing various input/output configurations. In 2-channel mode, for example, a single input can be assigned to both channels (left and right) for mono in/stereo out operation, or an individual input can be assigned to each channel for true stereo in/ste- reo out operation. Yamaha SRev1’s superb sonic performance is provided by Yamaha’s new convolution chip, 24-bit I/O, 32-bit internal signal processing, and 48 kHz internal wordclock. External wordclocks of 44.1 kHz and 48 kHz are supported and can be sourced via the dedicated BNC word- clock input, AES/EBU inputs, or card slot inputs. Up to four Yamaha SRev1’s can be controlled using the optional RC-SREV1 Remote Controller, which features a large 320 x 240 dot graphical display, with fluorescent backlight and adjustable brightness and contrast, four motorized faders for parameter editing, and input and output clip indicators. Power is supplied by the Yamaha SRev1.